Jackie Fo: Pumpkin is here! I know it's officially fall, because I'm turning orange. Not really, but I might as well be. I've already baked 2 pumpkin treats and have had several Starbucks Pumpkin Spice Lattes (no whip of course) in the span of about 1 week. This fabulous recipe makes two loaves and is perfect warmed up for breakfast with a cup of coffee. Preferably pumpkin flavored coffee. Another decadent option? Make this a dessert treat by frosting with cream cheese frosting. Yumm! I add in a few teaspoons of pumpkin pie spice, just to make sure it's extra pumpkiny, and I leave out the nuts. Preheat oven to 350°F. Butter and flour two 9x5x3-inch loaf pans. Beat sugar and oil in large bowl to blend. Mix in eggs and pumpkin. Sift flour, cloves, cinnamon, nutmeg, baking soda, salt and baking powder into another large bowl. Stir into pumpkin mixture in 2 additions. Mix in walnuts, if desired. Divide batter equally between prepared pans. Bake until tester inserted into center comes out clean, about 1 hour 10 minutes. Transfer to racks and cool 10 minutes. Using sharp knife, cut around edge of loaves. Turn loaves out onto racks and cool completely. I ripped this little treasure out of Real Simple Magazine a while back and have held on to it ever since. You could use the Epicurious bread recipe for cupcakes, but this Real Simple Cupcake recipe is so much lighter and fluffier. In my opinion, I like fluffy cupcakes, and dense bread. So this is worth making on its own. Plus you use a box cake mix as a base, so there is really nothing to complain about. Decorate these however your heart desires! Heat oven to 350° F. Line two 12-cup muffin tins with paper liners. Prepare the cake mix as directed but with the following change: Add the pumpkin pie spice and substitute the can of pumpkin puree for the water called for in the package directions. Divide the batter among the prepared muffin tins and bake until a toothpick inserted into the center of a cupcake comes out clean, 18 to 22 minutes. Let cool. Meanwhile, using an electric mixer, beat the cream cheese and sugar until creamy. 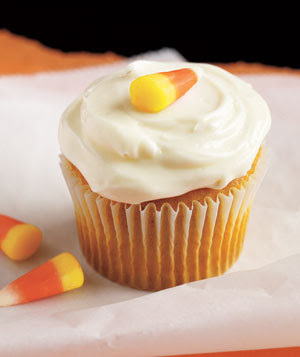 Spread on the cupcakes and top each with a piece of candy corn. In the mood for another fall treat? Read up on my latest Tablespoon article - it's all about Butternut Squash! 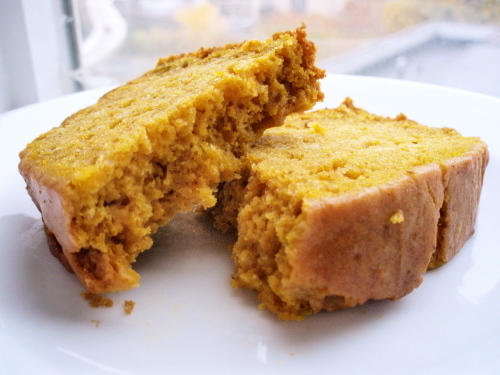 I looooove pumpkin bread and have already whipped some up myself. I also befriended the Starbucks manager who lives upstairs and he gave me a full GALLON of pumpkin spice syrup that they use in S-bucks. Watch out fat pants. I will be wearing you soon. I just had a banana bread baking bonanza last weekend that will be up soon....and honestly, I couldn’t help but add some pumkin into one of the recipes...delish! Thanks for the new recipes, I can’t wait to try them! How to make Soft Pretzels! A Rustic, Elegant and FUN Wedding! 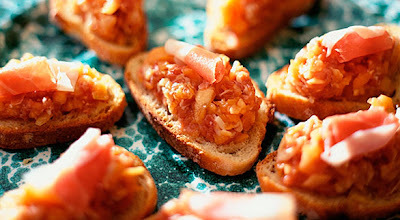 Blogger Meet up and Football Dips ands Tricks!